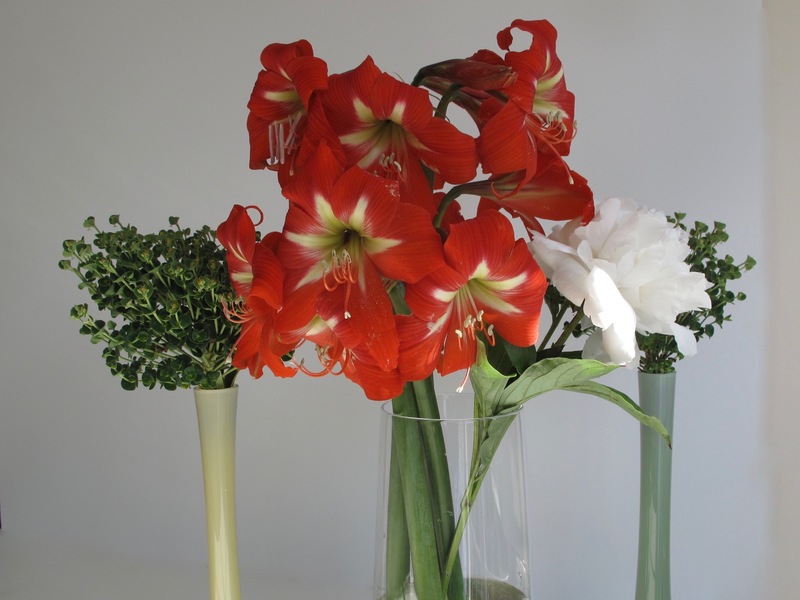 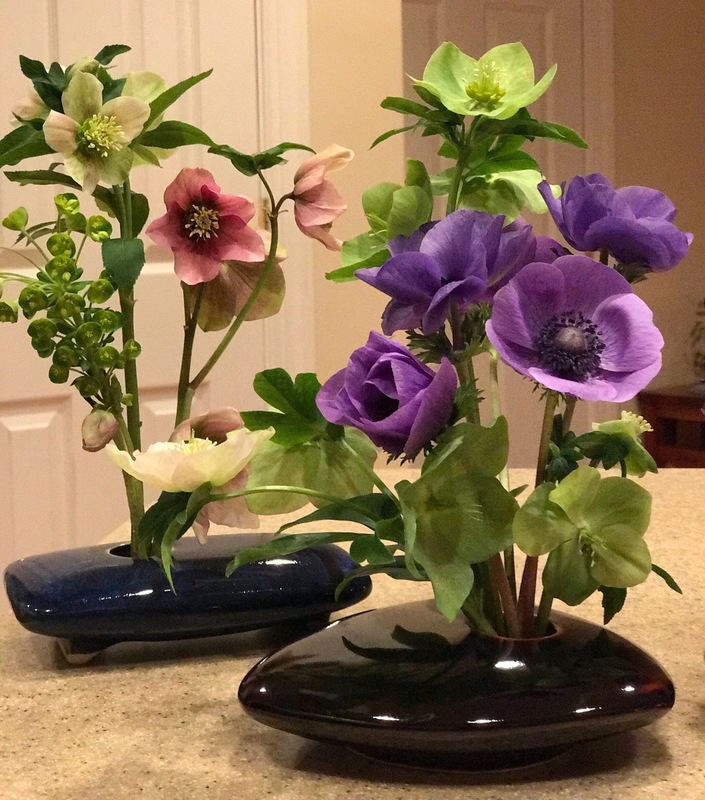 Each Monday brings the chance to join Cathy’s In A Vase On Monday to share an arrangement using materials gathered from the garden. 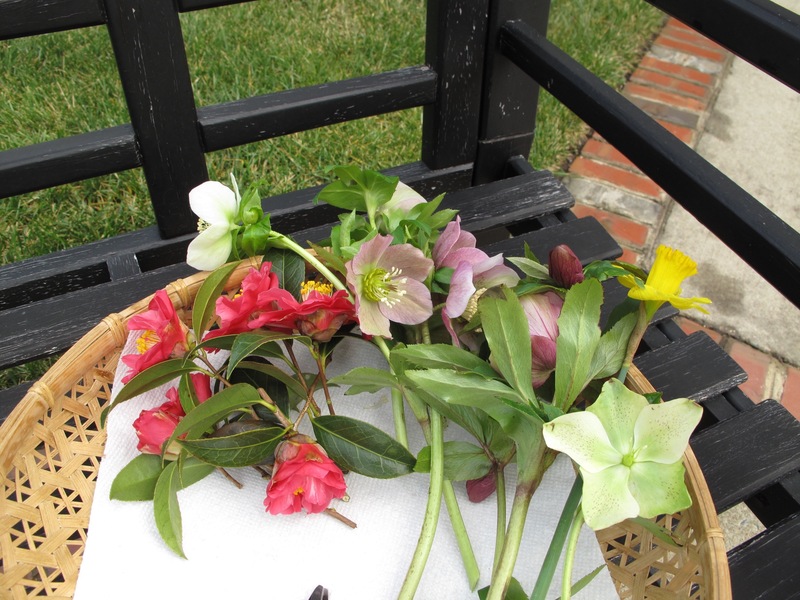 After last Monday’s snow, sleet and ice covered the garden once more, the weather relented, and the days since have been mild and mostly sunny. 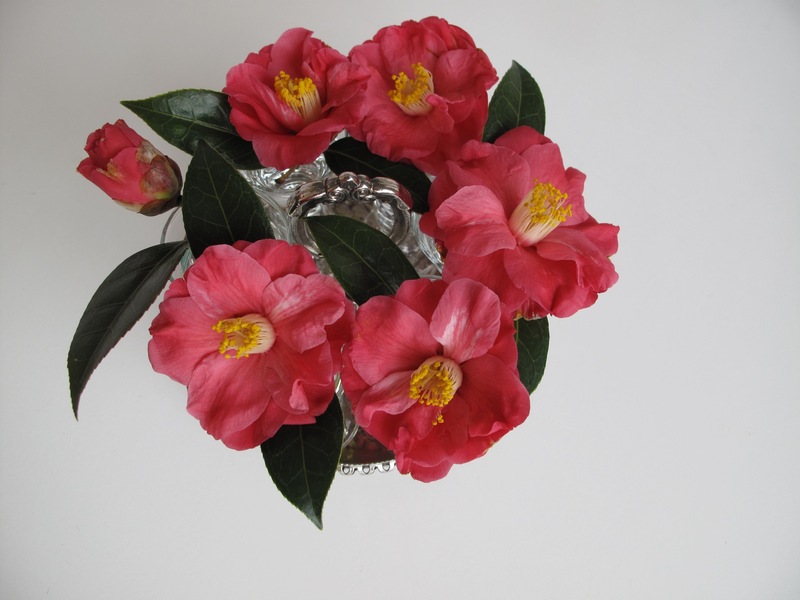 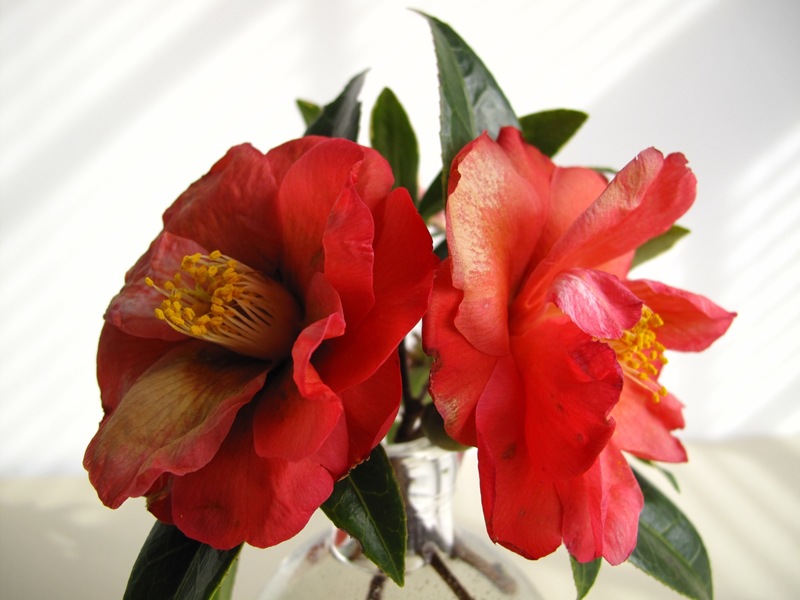 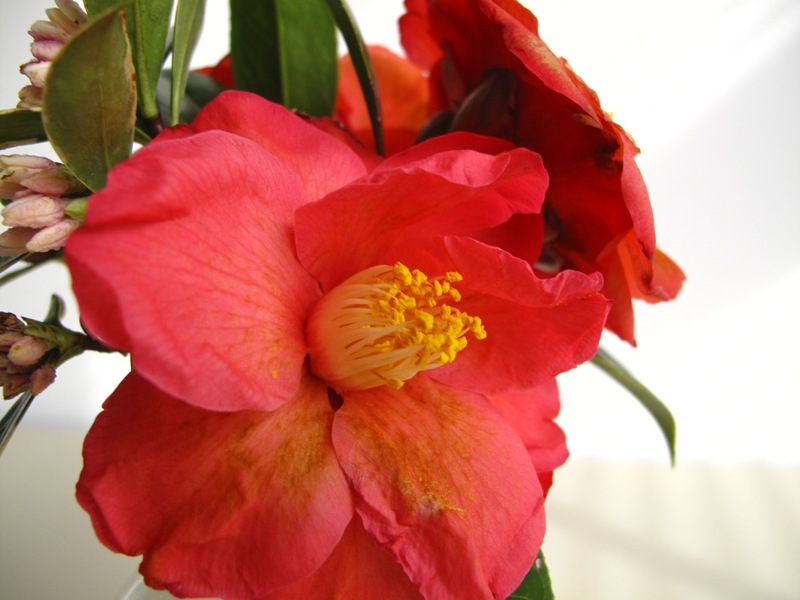 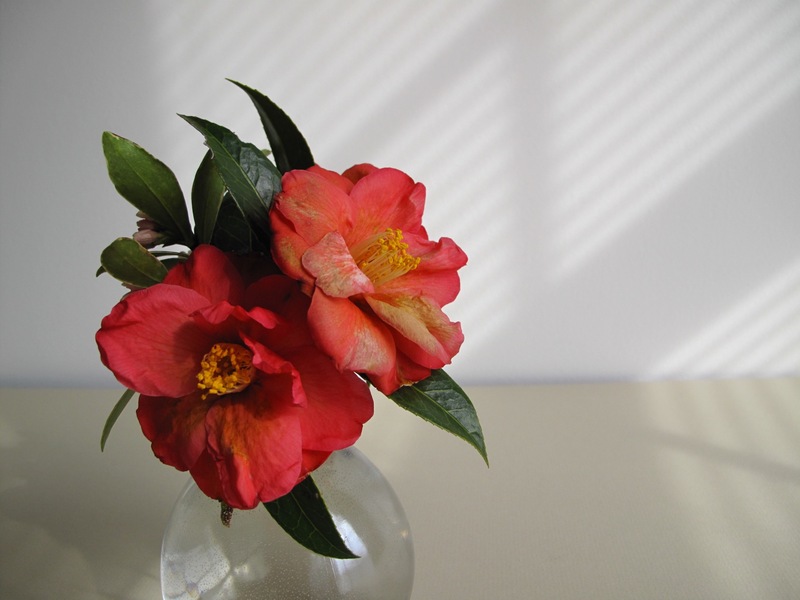 The Coral Delight Camellia featured last week with rescued, faded blooms is back with a fresher look. 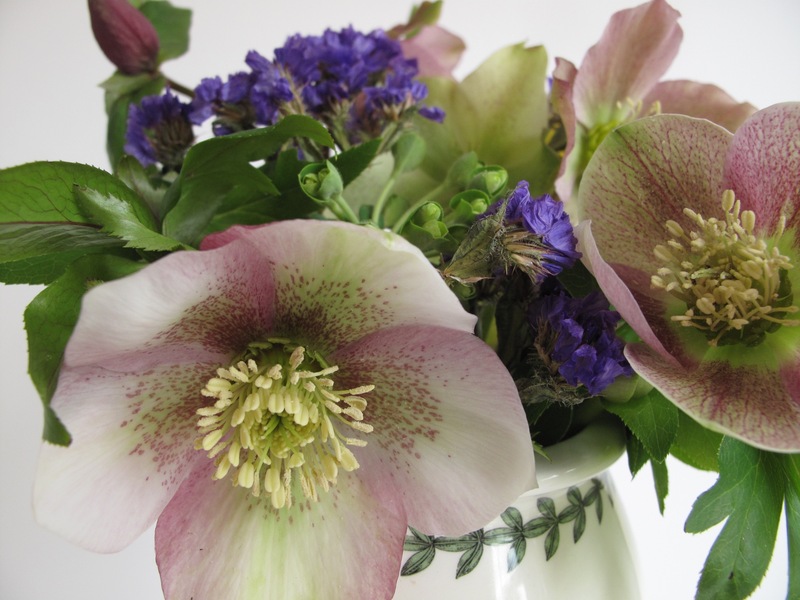 And Hellebores deserve a share of spotlight as they are at last coming into full flower in the garden. 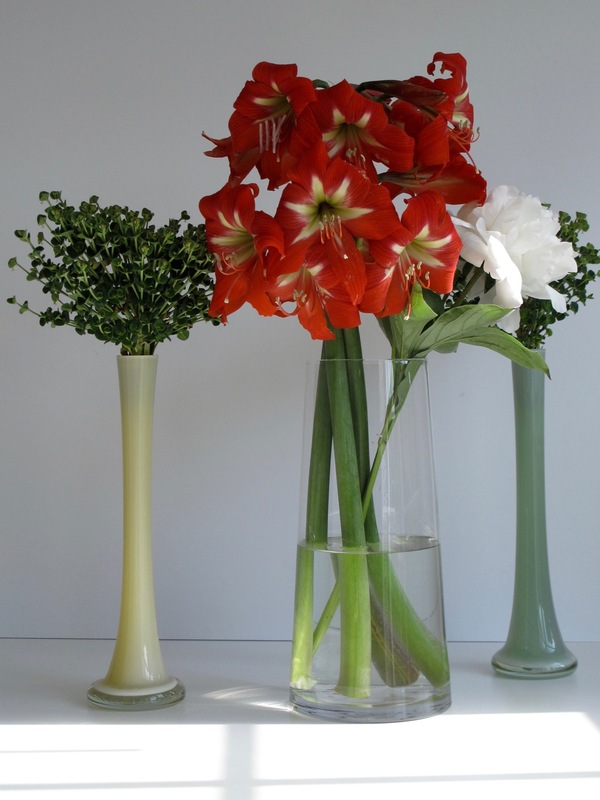 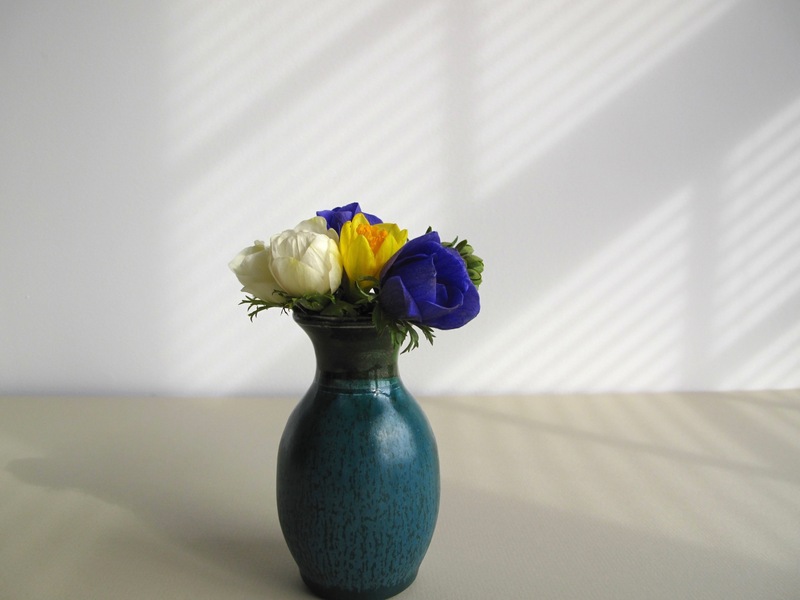 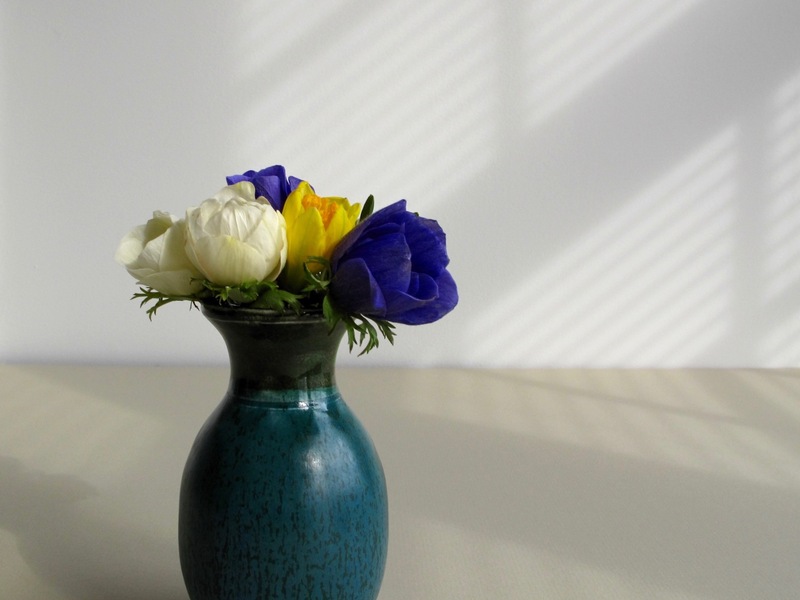 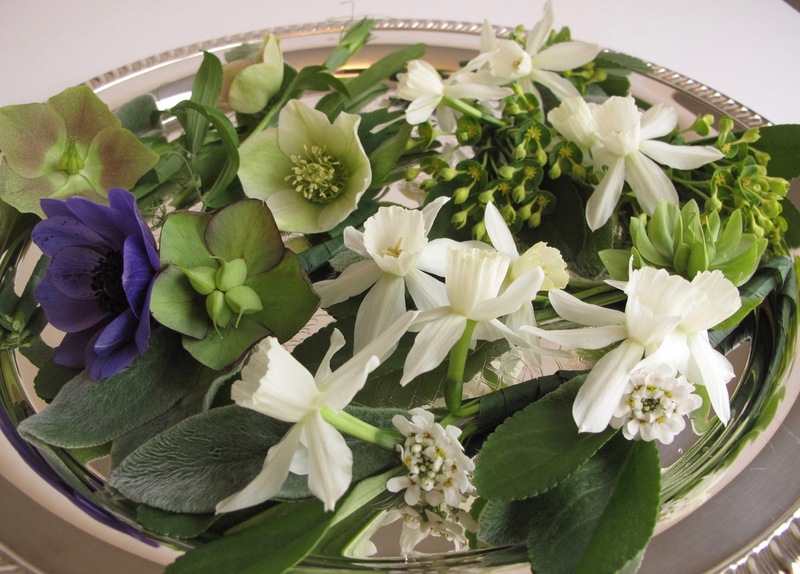 As I gathered these cut flowers on Sunday morning I intended to work them all into a single arrangement. 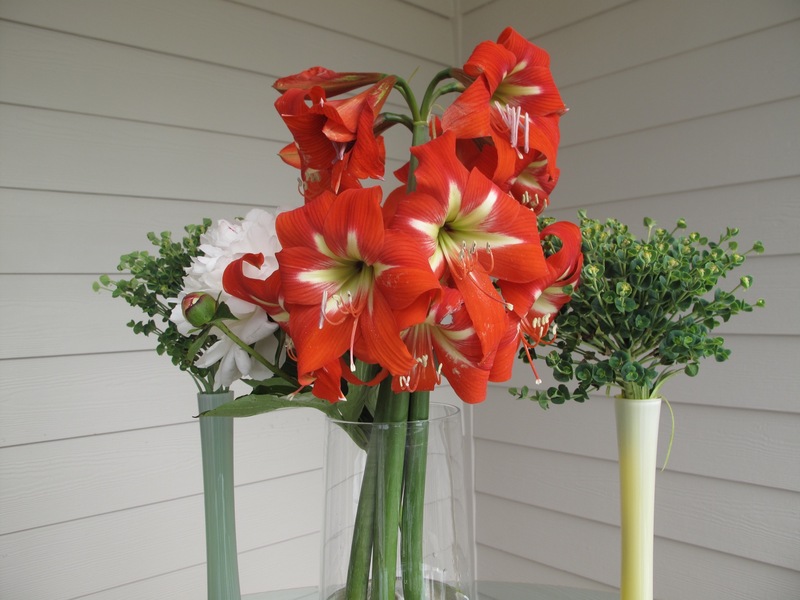 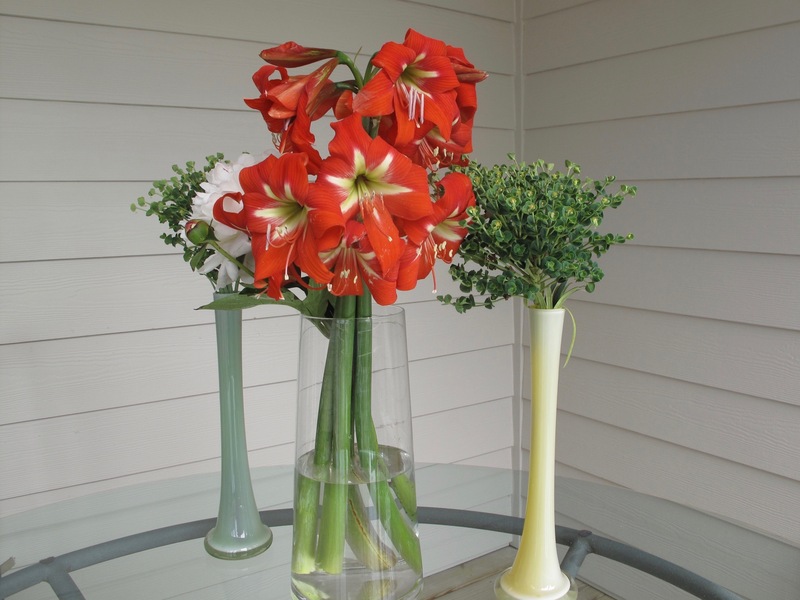 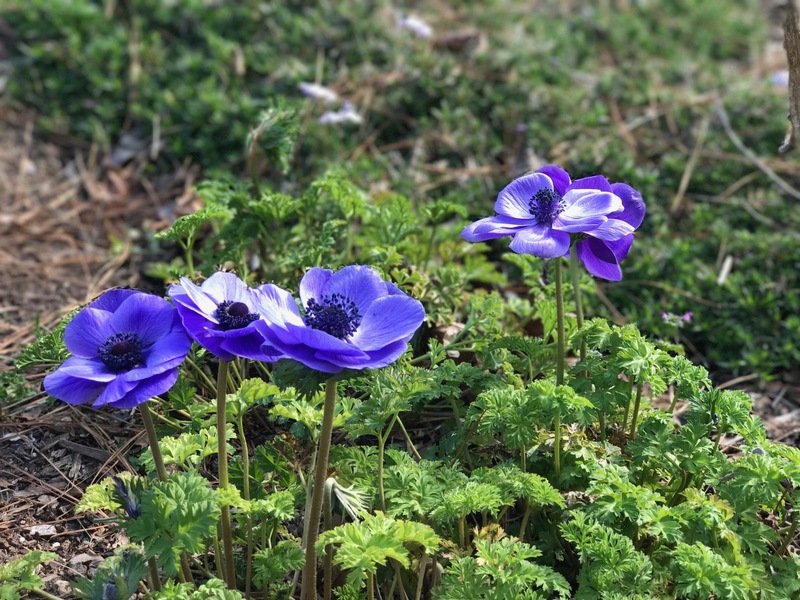 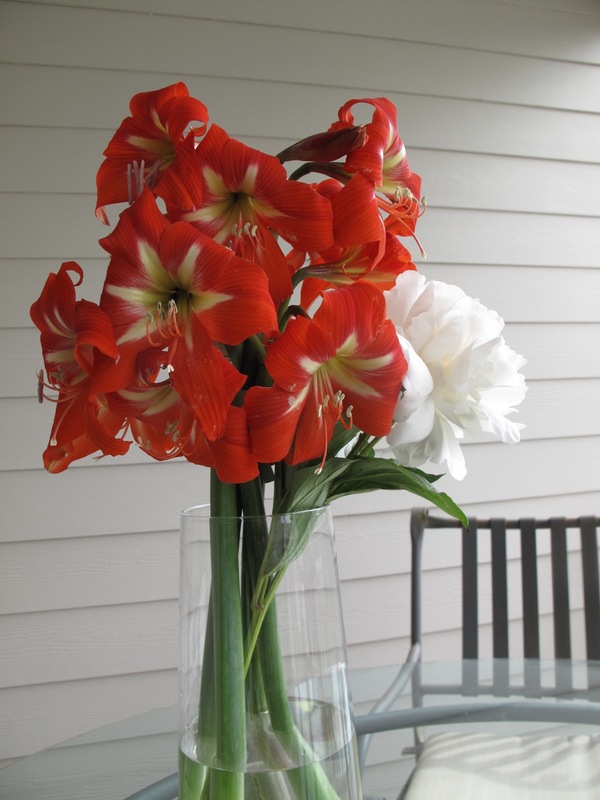 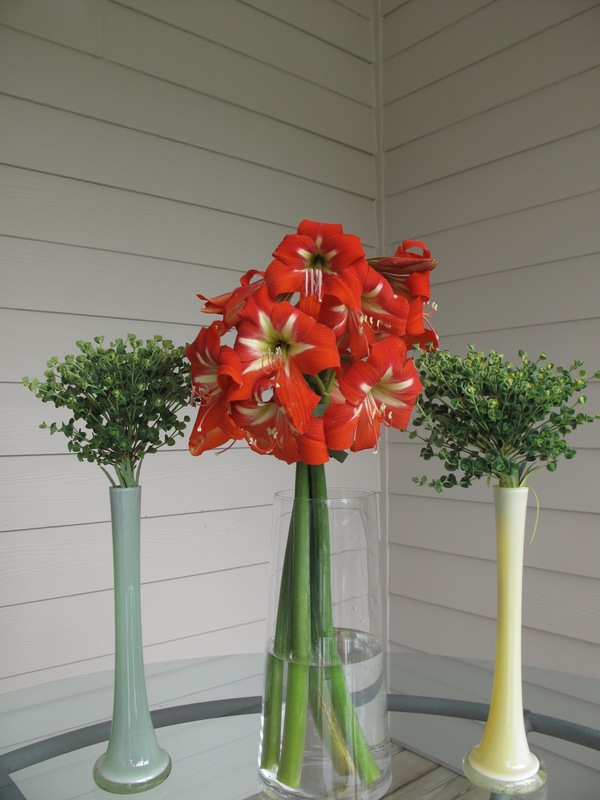 But after conditioning them in water (while my husband and I ran out to brunch with a friend), it seemed quicker and more manageable to keep the two main types of flowers separated. 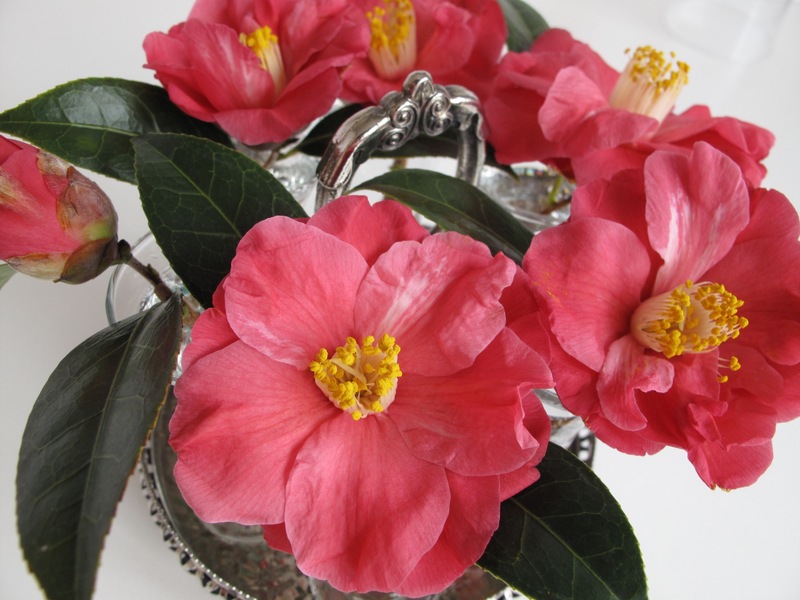 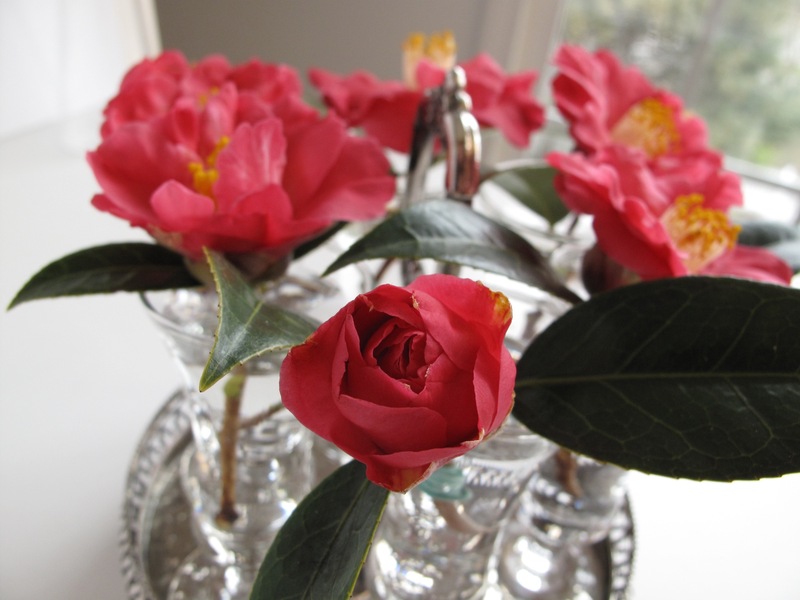 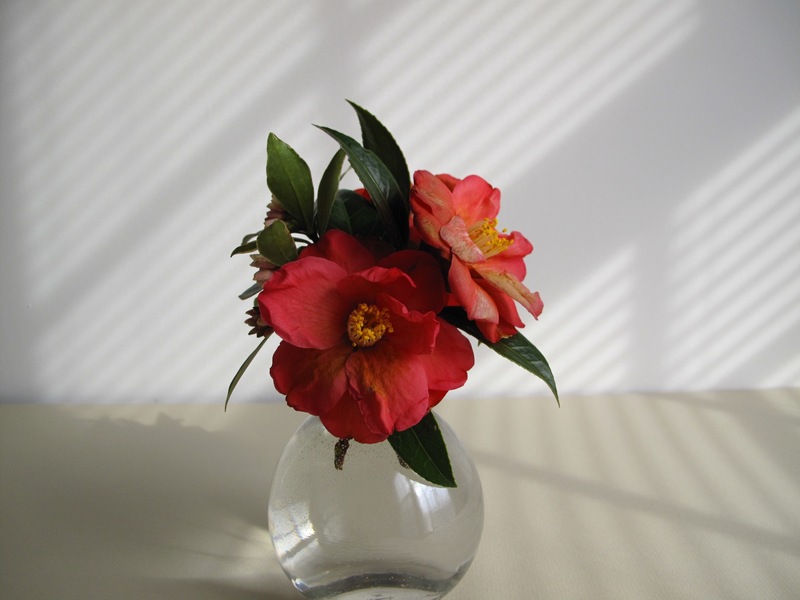 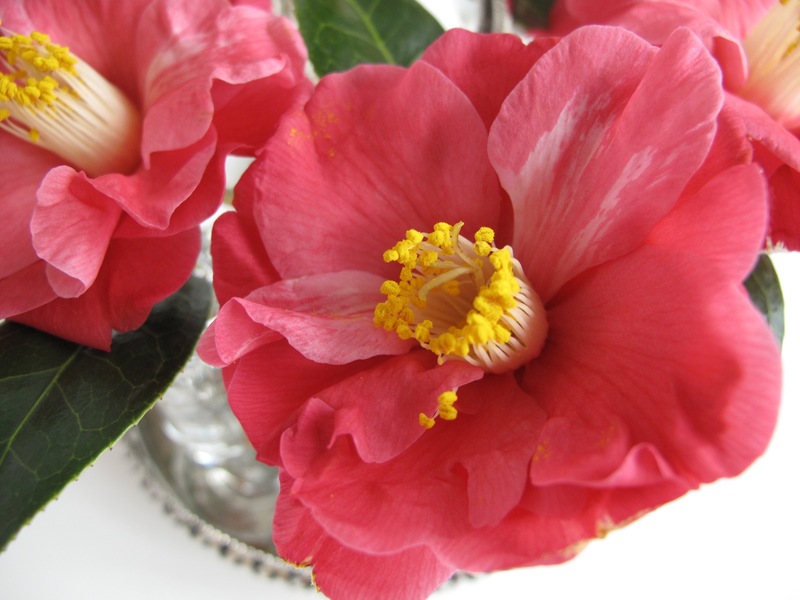 There were a half-dozen camellias in bloom, perfect for displaying in a set of footed cordial glasses. 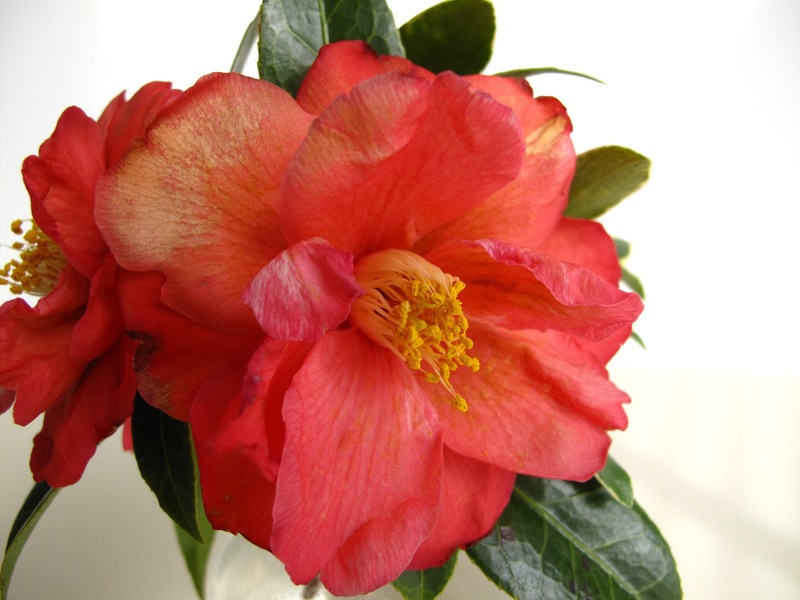 Camellia x ‘Coral Delight’ has a semi-double flower, deep coral pink in color. 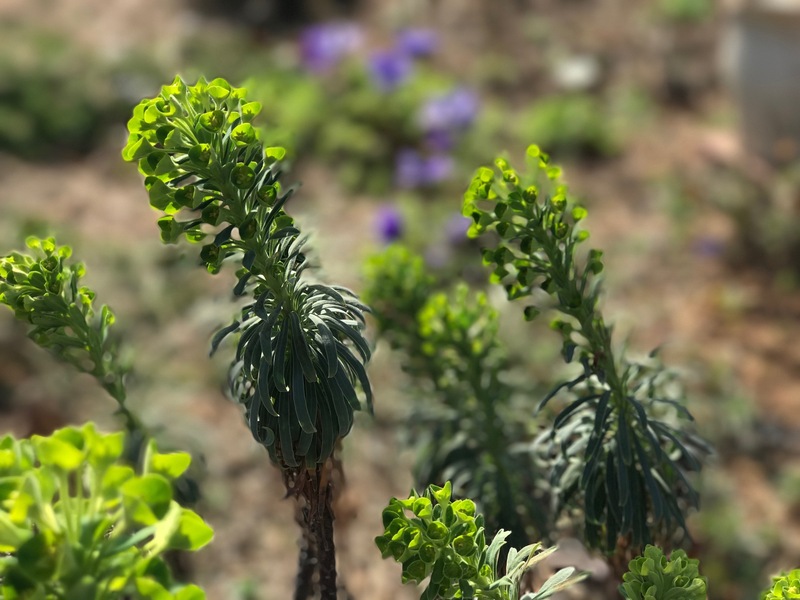 The plant is slow-growing, aspiring to 6-8 feet high. 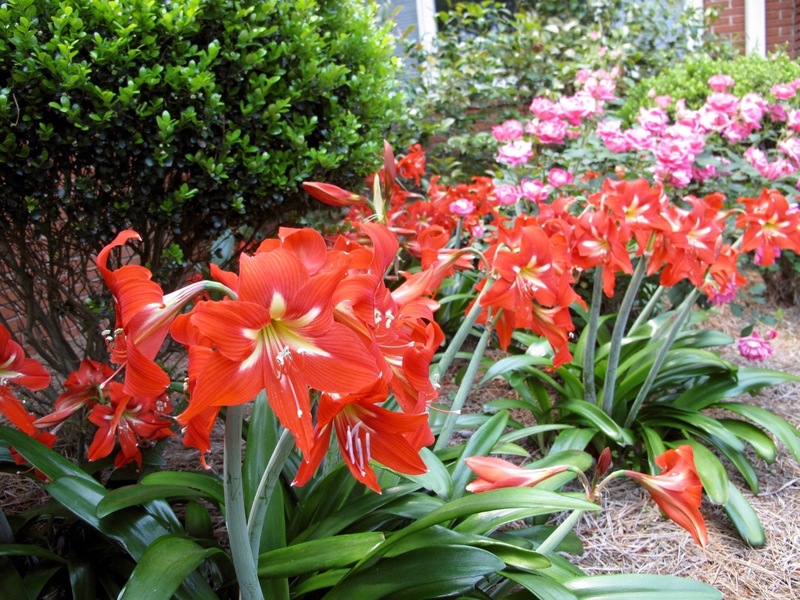 This one is about 4.5 feet tall after about ten years, with dark, shiny foliage. 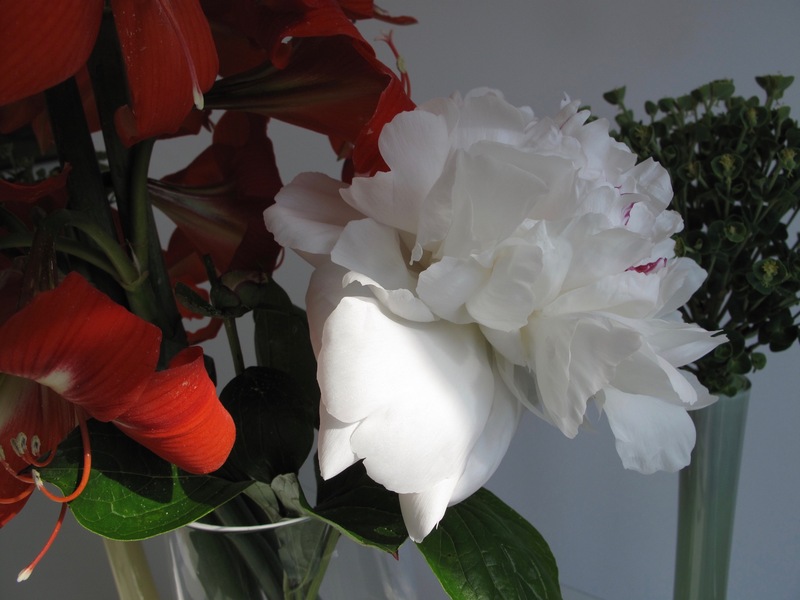 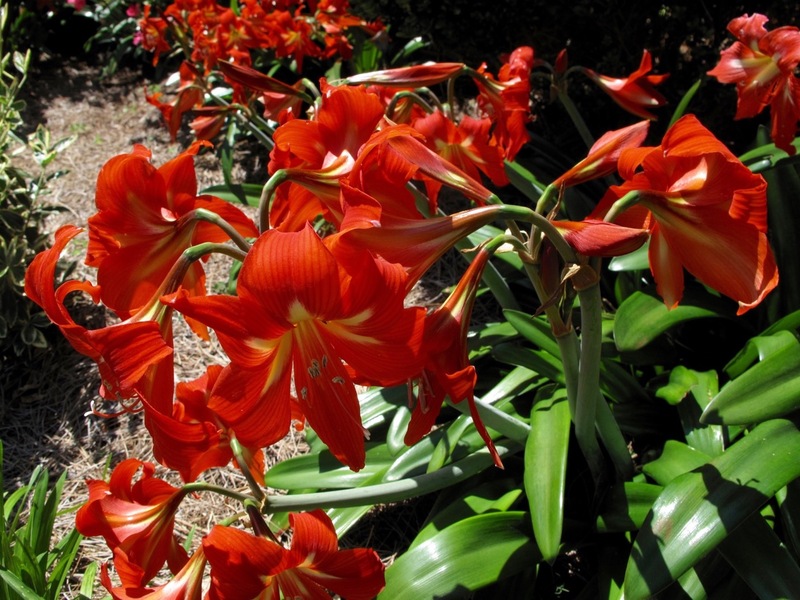 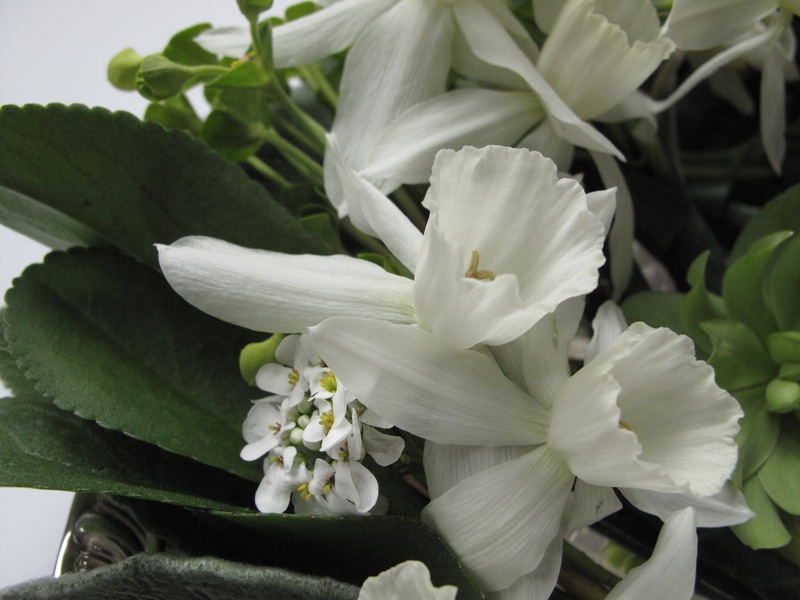 The blooms are brushed with white markings on the petals. 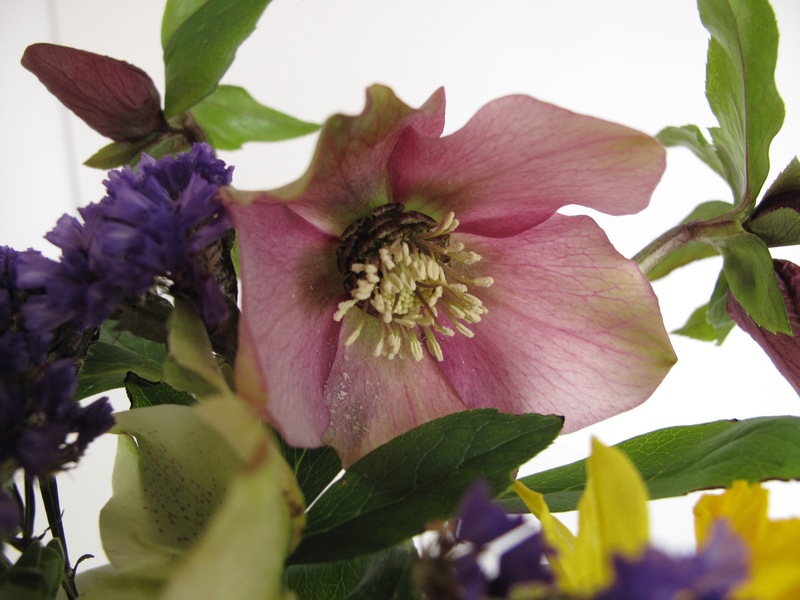 Hellebores in my garden have been reluctant to open this winter. 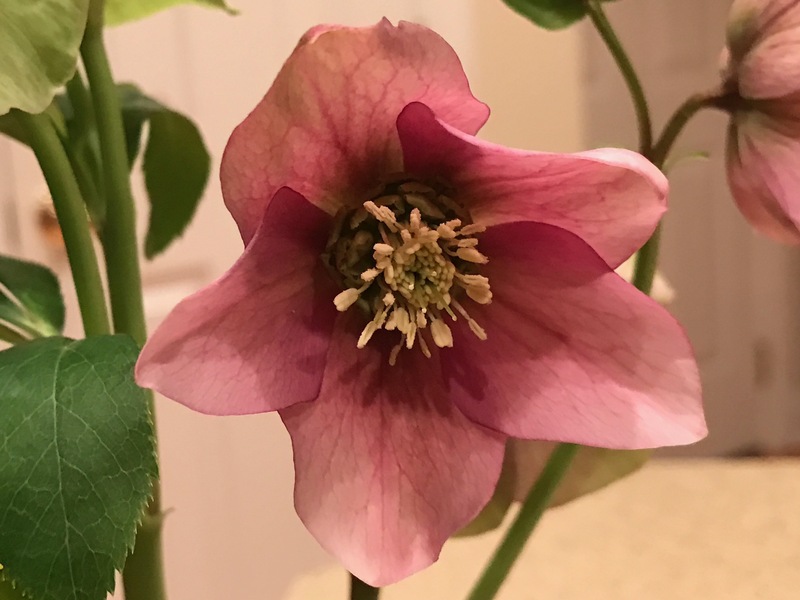 I visited a hellebore farm yesterday with a friend and we were surprised to find fewer blooming plants than imagined. 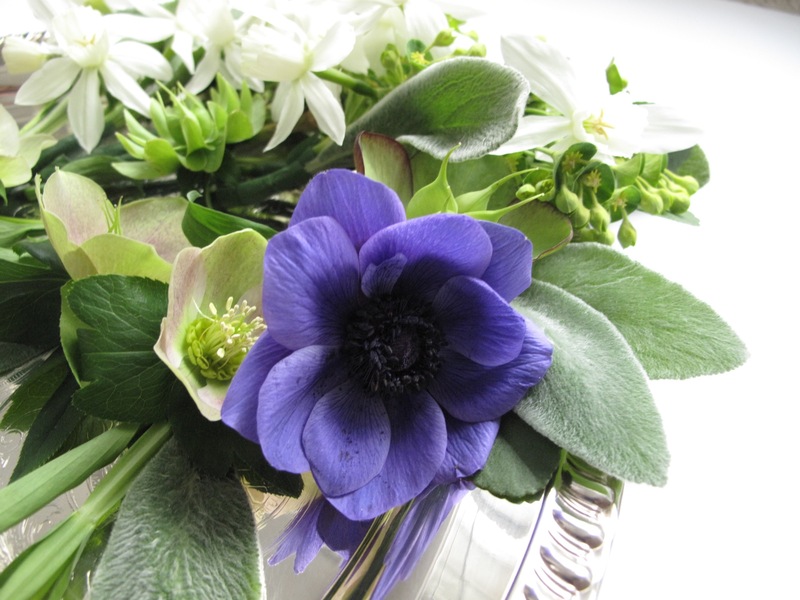 When I have organized my pictures I will write more about the visit and purchases. 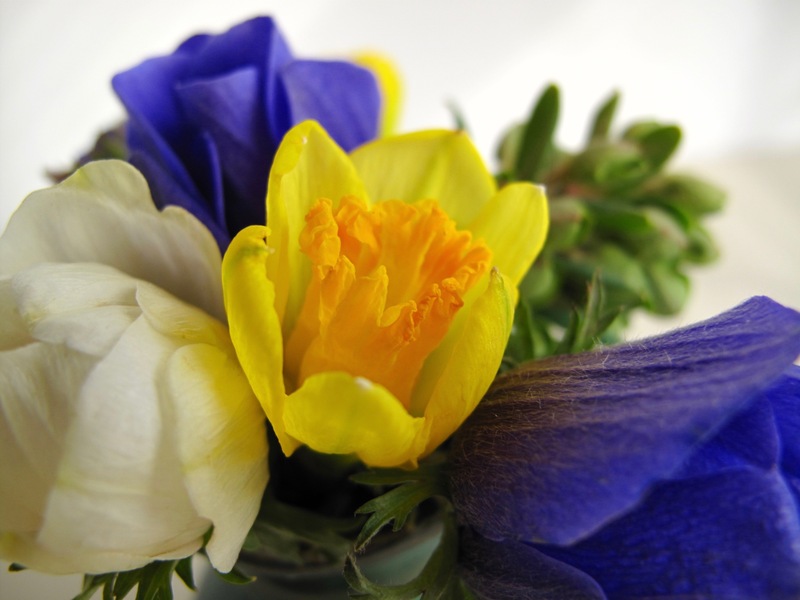 Only one daffodil was blooming yesterday, but many more are about to burst onto the scene. 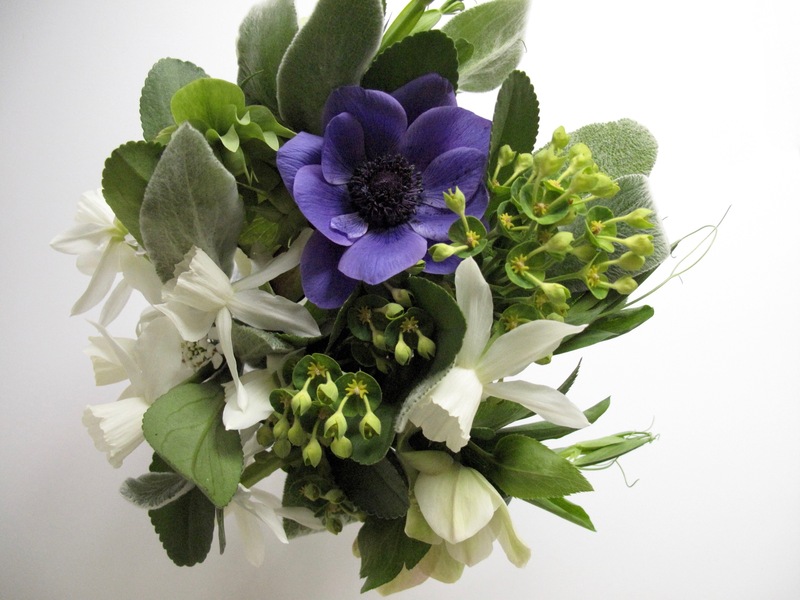 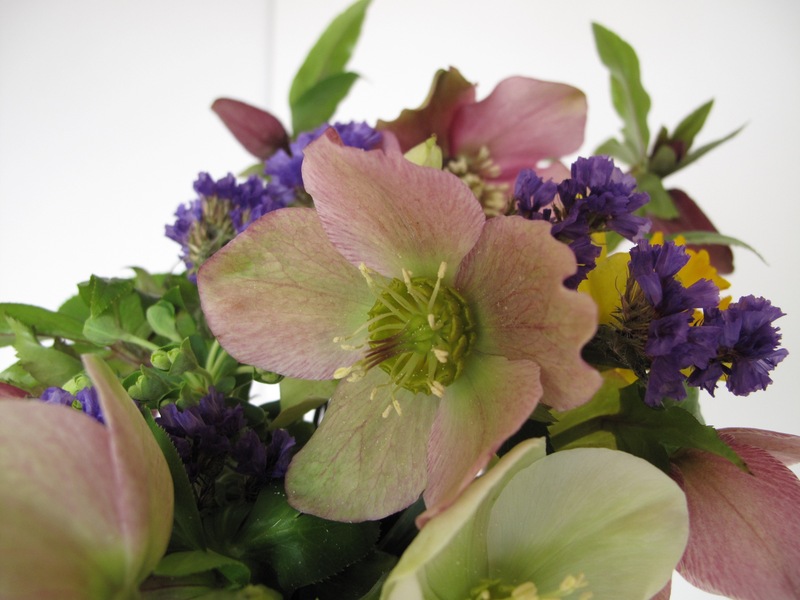 I included it with the hellebores for a sparkle of color. 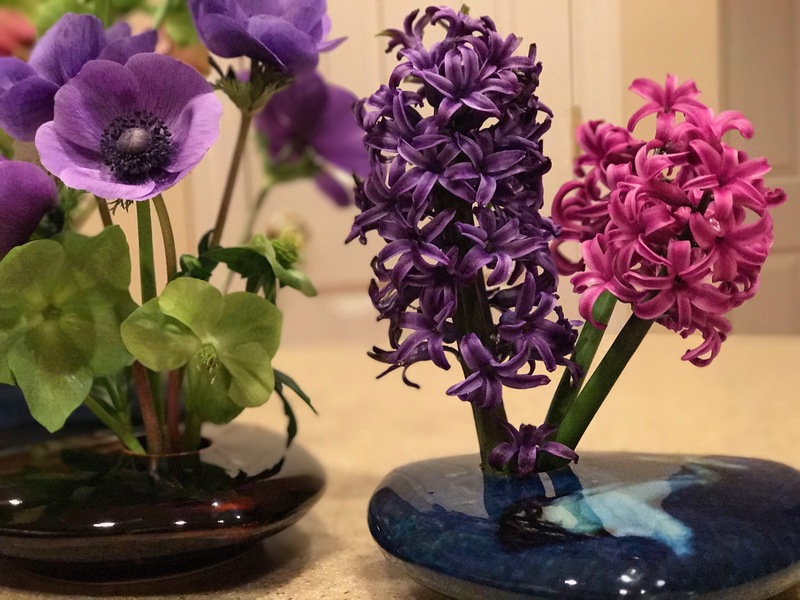 Purple stems of statice from a store-bought bouquet from last month and a piece of Shorty Euphorbia from last week’s vase were used as filler. 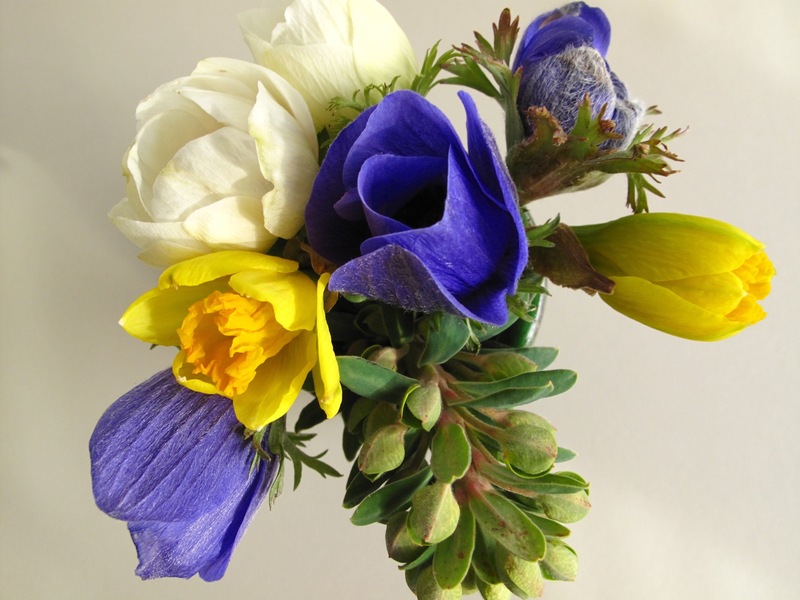 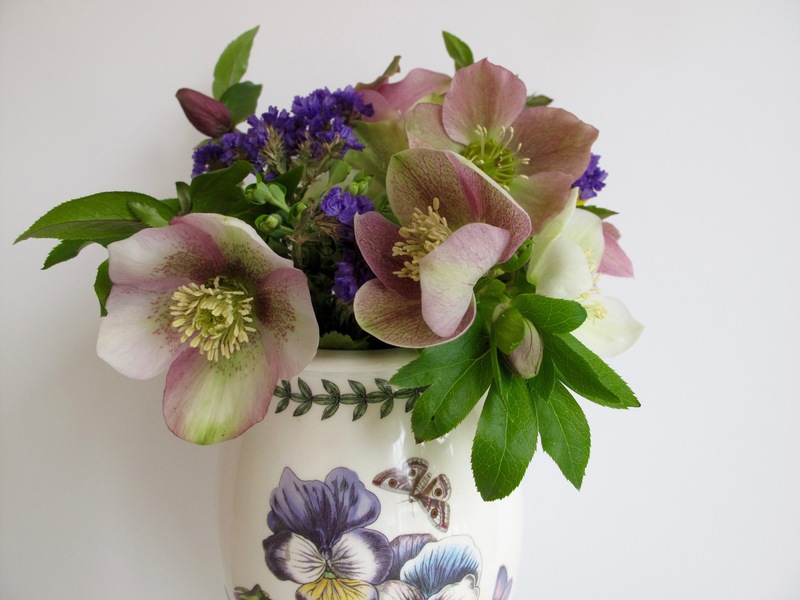 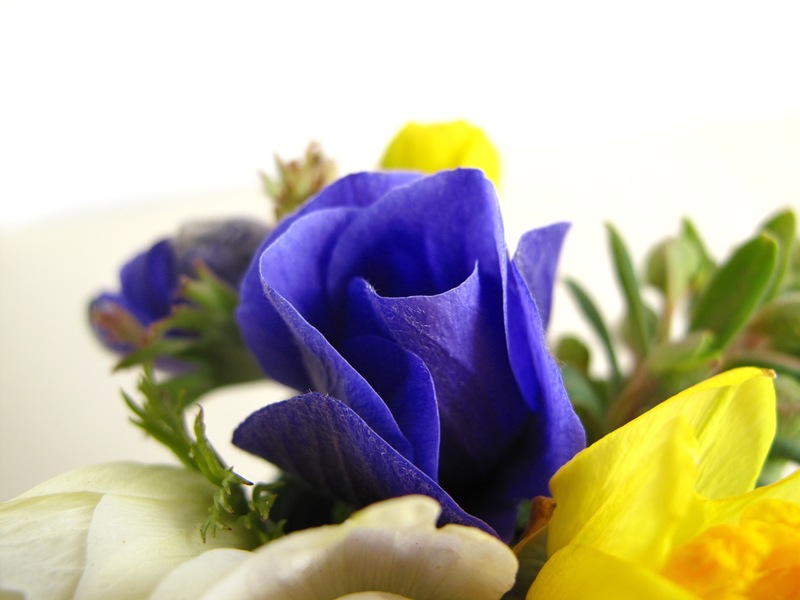 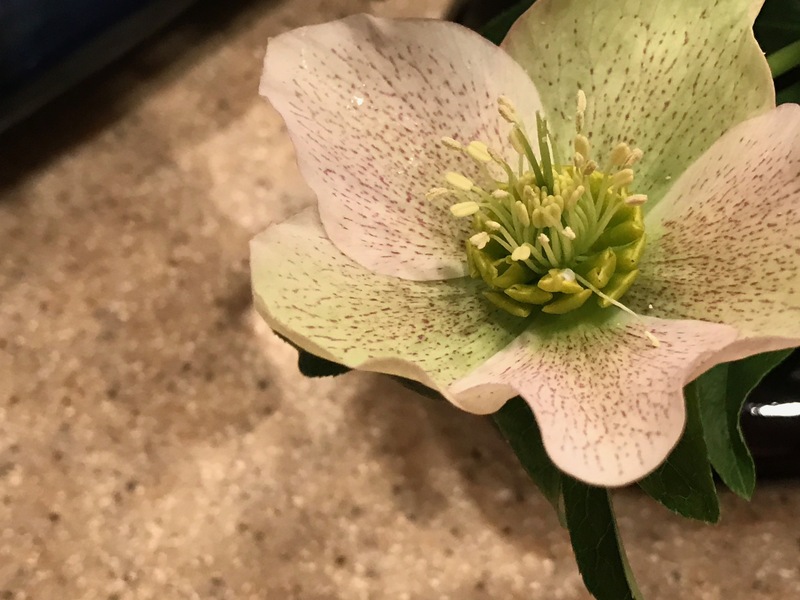 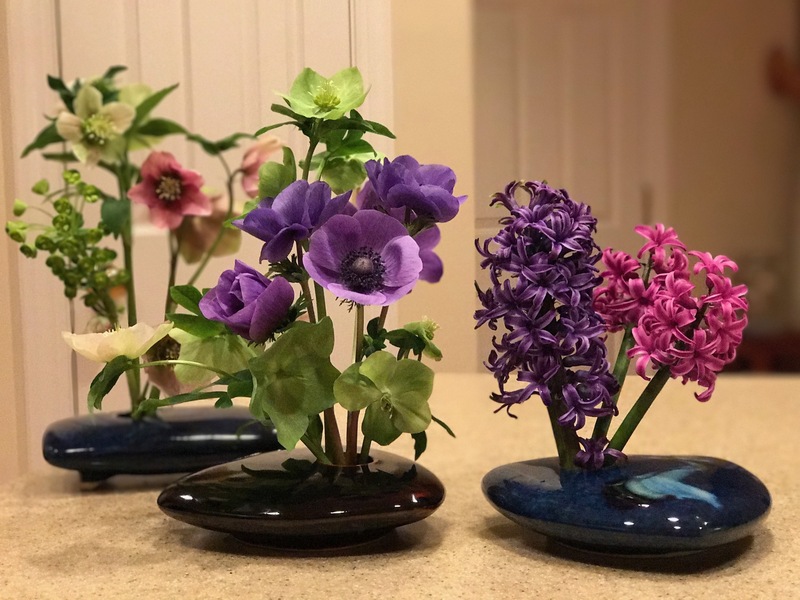 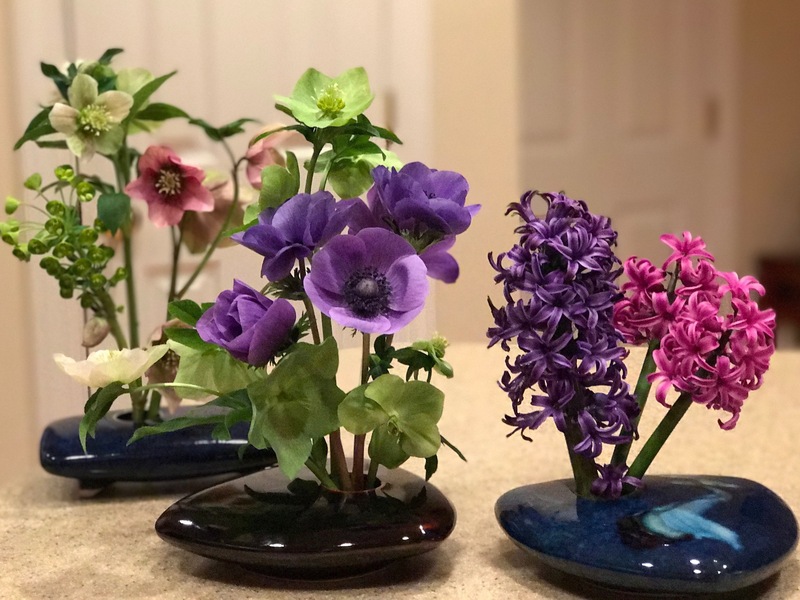 The hellebores were placed into a Portmeirion Botanic Garden vase, detailed with pansy motif and leaves around the rim. 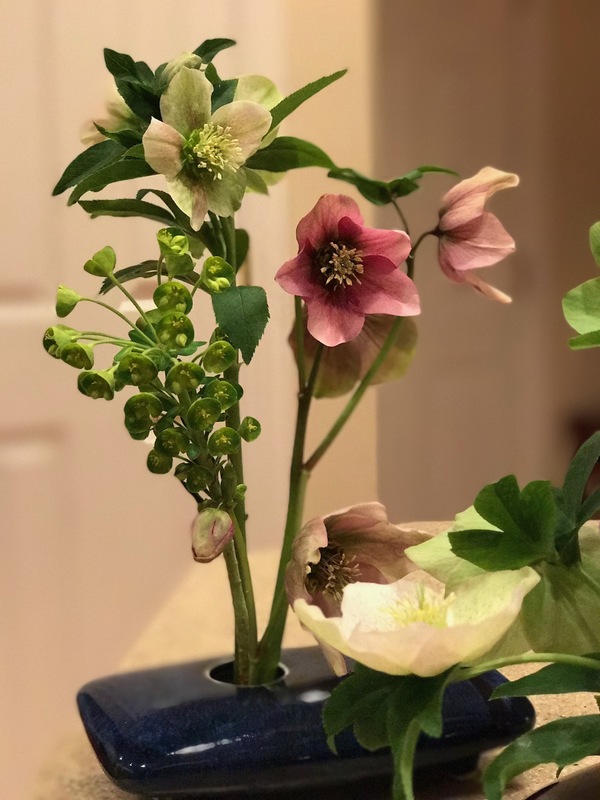 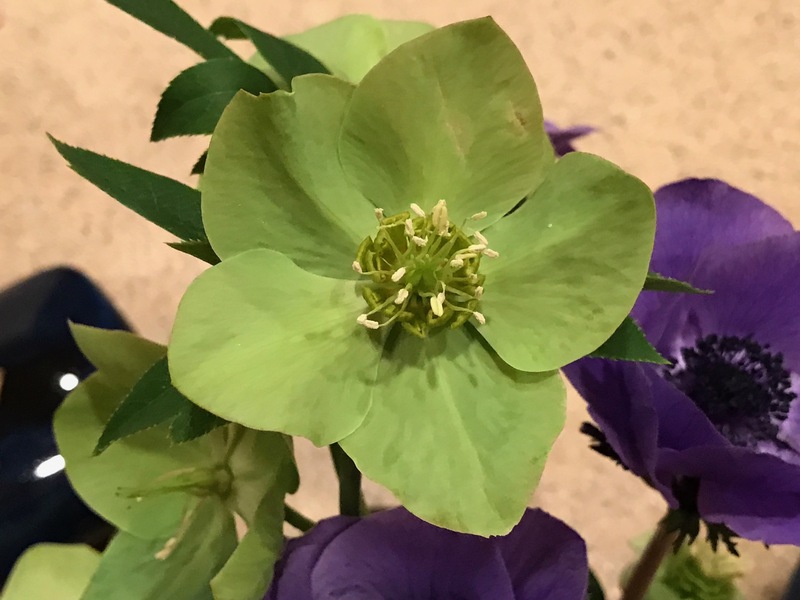 This entry was posted in garden and tagged Camellia 'Coral Delight', Euphorbia 'Shorty' (Shorty Spurge), flower arranging, flower design, Helleborus x hybridus (Lenten rose), in a vase on monday, narcissus, nature photography on February 22, 2016 by pbmgarden.